The NUOFA 3 is a training program developed by PEAK and designed for professional (paid and volunteer) non-urban responders such as ski/bike patrollers, search & rescue technicians and guides who are tasked with providing advanced emergency medical care to clients and workers. Please contact us for further details and bookings. 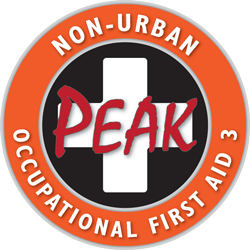 Student candidates for the PEAK NUOFA 3 program may already possess certification in other first aid and medical training programs. For those candidates with demonstrated proof of certifications(s), PEAK has developed a specialized training program: the NUOFA 3 Bridging Course. The NUOFA 3 Bridging Course has been designed to adapt and upgrade a candidate's previous skills and knowledge base to manage the emergency medical care problems encountered in the non-urban environment. CERTIFICATION MAINTENANCE - NUOFA 3 Providers are required to attend, every calendar year, an Annual Skills Update (ASU) course (click here for further information regarding ASU courses) and in addition are required by WorkSafe BC to successfully complete an NUOFA 3 Review & Evaluation Course every 2 years.